You are hereCould we Restore Arctic Sea Ice with Geoengineering? 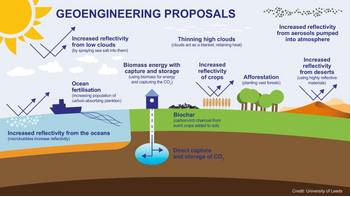 Could we Restore Arctic Sea Ice with Geoengineering? In a paper just published in Geophysical Research LettersIAGP researchers perform a novel simulation where we see if it is possible to restore Arctic sea-ice using stratospheric aerosol injected by planes flying out of Svalbard. We treat a single model run as the real world and examine practical decision making under imperfect observations and incomplete understanding of climate response. We found quantifying climate side effects problematic. Nevertheless, through decision maker learning and the accumulation of at least 10 years’ time series data exploited through an annual review cycle, uncertainties in observations and forcings were successfully managed. This work involved Lawrence Jackson, Julia Crook and Piers Forster.